If you travel a lot, you fly a lot. And while noise-cancelling headphones are an absolute must for their skill at suppressing the 85 decibels ay 40,000ft, they’re often too bulky to be considered savvy travel gear. The H8 changes all that. We got ears-on with these hugely flexible and lightweight cans at the Venetian in Las Vegas, and were really impressed. They’re got pretty much all the tech you might expect; they link to a phone or tablet quickly and automatically over Bluetooth 4.0 (though there’s also a wired cable in the box), and they run on an internal battery that lasts 14 hours. Switch the Bluetooth off and it should last for a stunning 30 hours. The material the H8 use are stunning. A combination of cowhide leather for the headband, soft lambskin inside and memory foam in the earcups, everything about the H8 screams luxury. We paired our phone with them for about ten minutes, engaging the noise cancelling tech (by swiping the right-hand earcup). It was impressive – and the cans were comfy. They’re just so light. BeoPlay H8 is available in two colours: Gray Hazel and Argilla Bright. 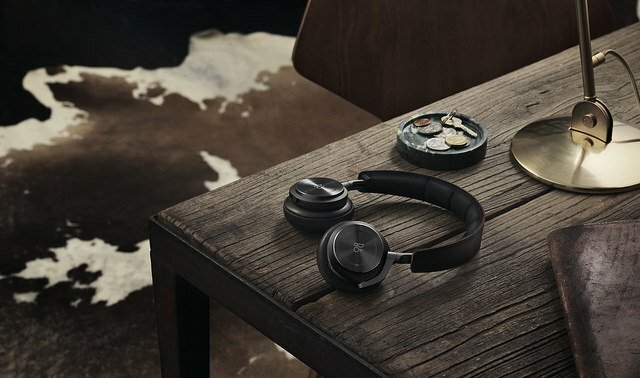 Whereas a lot of headphones include buttons on the earcups that you have to learn about, the H8 uses gestures and bent aluminium, so sweaty, dry or gloved hands work – this isn’t like a glass touchscreen found on phones. Swiping a finger up or down engages or switches-off the noise cancelling, while volume is left to right and back. The H8 doesn’t come with a bulky case; instead, they flex and bend so effortlessly that they should just slip into a bag. At just 256g, they’re surely the comfiest and the most travel-friendly noise cancelling headphones yet.